Summary by Simon Mustoe, EIANZ Ecology. Presentation by Kerry ten Kate, Director of Forest Trends' Business and Biodiversity Offset Program, to EIANZ ACT Division, 26 March 2009 at CSIRO Sustainable Ecosystems. The Business Biodiversity Offsets Program (BBOP) currently engages about 40 organisations, including large multi-national companies such as Shell and Rio Tinto; about 16 governments including Australia, Mexico, South Africa, Uganda and the Netherlands; several of the large conservation NGOs; and coordinates a learning network of nearly 1,000 people world-wide. Increasingly, a number of banks and financiers are also looking to BBOP, particularly in relation to their commitment to the Equator Principles. Biodiversity is about the structure and function of the landscape. 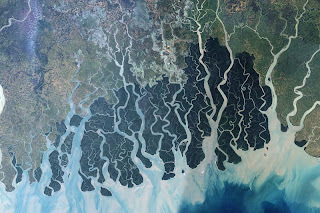 This satellite image of the Sundarbans in Bangladesh shows it surrounded to the north by a landscape of agricultural lands, which appear lighter green, towns, which appear tan, and streams, which are blue. Biodiversity is a landscape-scale driver of the human economy, as water quality is under stress from environmental disturbance thousands of kilometers away, caused by deforestation in the Himalayas far to the north. Biodiversity offsets are inherently multidisciplinary so they need to satisfy not just conservationists but indigenous people, local governments, developers and financiers. They also need to be practical, measurable, verifiable and defensible. Offsets are not a process. Offsets are the measurable outcomes designed to compensate for residual impacts (after appropriate prevention and mitigation) (see Principles in Biodiversity Offsets). The goal is to achieve no net loss and preferably a net gain on the ground. That is, there must be in situ, measurable conservation outcomes. This is fundamentally different from research, capacity building and training. All these things can support the successful implementation of an offset, but are not the offset itself (unless they result in measurable in situ outcomes). For four years, BBOP has worked closely with a 'brains trust' of about 80 individuals who have been actively involved in offsets, some for as long as 30-40 years. Although the concept could be debated for decades, the proof of offsets is in real outcomes, so one of BBOP’s objectives has been to set up pilot projects, with the aim of demonstrating "no net loss" of biodiversity. A coal mining project with Solid Energy in New Zealand. A second objective of BBOP was to develop a 'tool kit' to facilitate development of offsets by providing advice on matters such as, how to measure biodiversity, how to define conservation significance, and how to integrate important social and cultural functions. This tool kit will shortly be ready and provide an initial cradle-to-grave manual of how to go about designing and implementing offsets. Finally, BBOP’s third objective in its first phase was to influence policy and nurture the adoption of offset policies world-wide. BBOP is already engaging with the United Nations and a number of governments around the world. In addition, Kerry ten Kate and others, in their personal capacity, are part of teams advising the UK government and the European Union on offset policy development (see for example, http://www.treweek.co.uk/proj/defra-offsets.html). Many countries are now exploring or revising their law and policy on biodiversity offsets. For instance, Brazil is modifying its biodiversity offset laws and it is clear that, at the international level, there is a strong trend towards more involvement in biodiversity offsets and towards the development of international standards. However, the BBOP partners believe that further work and empirical experience is needed before any 'standards' could be developed. One of the objectives of the next phase of BBOP's work is thus to focus on auditing and verifying outcomes of pilot projects and try to increase the number of such projects world-wide, perhaps by collaborating with particular governments. Regulatory requirements can create the incentive for a developer to undertake a biodiversity offset, but it may not be mandatory and, with or without regulation, there are often compelling reasons for companies to undertake offsets voluntarily. The principal argument from companies, as to the business case for voluntary offsets, is to build license to operate: good working relationships with government and local community members that can save companies substantial sums through speedy permit approval and efficient operations thereafter. Also, companies prefer to avoid the costs and liabilities associated with poor environmental practice . Biodiversity constraints are increasingly being applied by global financiers, to the point that banks like HSBC and CitiBank and some 50 others have adopted the Equator Principles and will not loan more than 10 million unless environmental and social equity can be demonstrated. Unsustainable human development can have severe economic repercussions for communities and governments a long way downstream. There is no better Australian example than the decline of the once mighty Murray River. 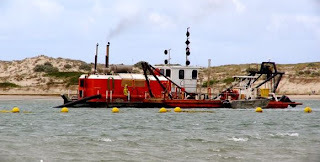 This dredge vessel in the Coorong exists to remove silt from the river's mouth. The cumulative impact of deforestation and the modification of substantial ecosystem processes such as fresh water flows, happens more quickly than even our economy can adjust. This creates considerable cost-burdens and social upheaval at a local level. A rigorous ecological assessment process and appropriate offsets can conceivably head off similar catastrophes in future. Photo D.M. Vernon, 2006, modified by SuperManu. No net loss of biodiversity can be a condition of a bank loan, in some circumstances. Rio Tinto has a board-level commitment to a net positive impact on biodiversity. With a trend towards development in wilderness or frontier regions, including the marine environment, the pressure to demonstrate no net loss or a net gain of biodiversity through offsets, will grow. Where offsets are part of existing legislation, this is of great value as it introduces an unambiguous requirement that affects all developers similarly. Several of Australia's states have sophisticated frameworks for biodiversity offsets (e.g. NSW). It is worth pointing out that the implementation of offsets through Ecological Impact Assessment (EcIA) is not a large step. Already, a well developed EIA (i.e. incorporating a rigorous EcIA process) can cover 90% of the data gathering needed to plan a quality offset. This does however depend on the quality of the assessment and one of the major failings that can be typical in EIAs is the failure to understand biodiversity loss at the landscape scale and instead to limit EIAs to the immediate development footprint and its periphery. It is also particularly important to consider socio-economic values of biodiversity, including cultural and spiritual values. There are ways this can be done quantitatively and it is essential to the integrity of an EIA and the offset outcomes, that indigenous and other local interests are adequately reflected. Once we understand that loss is part of a landscape-scale system, we can start to address cumulative impacts adequately at a strategic level. Strategic Environmental Assessment, along with rigrous project-specific assessment and management, are tools available to do this.